Cover of "Illustrated London News", January 9, 1915. 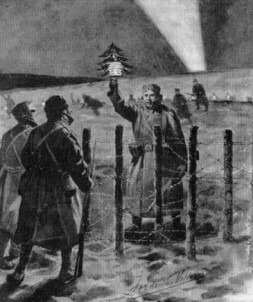 A German soldier approaches his British enemies with a lantern and a small Christmas tree and organizes a cease fire. They hated and they killed each other. Soldiers from invading Germany and defending French and British troops had dug themselves in 1914 along a front line with hundreds of miles of trenches, bunkers and barbed-wire which started at the North Sea at the Belgium port of Oostende, reached Nancy in France and ended in Switzerland at the Alps. Millions of men in arms, hundred of thousands died by machinegun fire, sharp-shooters or artillery fire in the Great War, later called World War I. It was the European eruption of self-destruction, which later led directly to the destruction of the old aristocratic systems in Germany and Austria and the rise of WW I private Adolf Hitler whose bitterness and amoral killing instincts were first inflamed in the fire-rain of this war. The lost war gave him a mission and a once-in-a-lifetime chance fuelled by the frustration of millions of Germans in the vacuum afterwards. WW I also led to the October revolution in Russia, led by Lenin and later to the Cold War between the East and the West, which lasted until 1989. Like a domino effect, the Great War played out its negative dynamic for over 75 years to come. It gave birth to the destruction of Old Europe and the rise of the Nazi and Communist totalitarian dictatorships between 1918 and 1945 that resulted in the death of more than 50 million people in World War II and internal terror. But on the Christmas Eve of December 24th, 1914, something happened which has never ever happened before: the German soldiers started – out of the blue – a grassroots movement for peace and a spontaneous cease-fire. On the frontline, they wanted to end fighting for the Christmas days and celebrate Peace on Earth. At the beginning, the German star-journalist Michael Juergs writes in his new book (“Der Kleine Frieden im Großen Krieg,” Random House), German infantrymen in Belgium started to sing their favorite Christmas songs “Stille Nacht, Heilige Nacht” (Silent Night, Holy Night) and “Oh Tannenbaum” (“Oh Christmas Tree”). On the other side, only 100 meters away, the British and French soldiers started to applaud and shouted: “Good, old Fritz”, “Encore, Encore” and “More, More.” The Germans answered, “Merry Christmas, Englishmen” and “ We not shoot, you not shoot!” They put candles on their rifles and held them in the air to show them to the other side. Some built up Christmas trees with candles like in the living rooms at home. The English were first suspicious about these acts of peace from the hated “ Huns”, “Barbarians” and “Krauts.” Was this a perverse dirty trick on Christmas? It was the mood of the German ordinary soldier who, instead of the expected “War Game,” a kind of “Gentleman’s Hunting event “or “Picknick in Arms” for some adventuroius weeks, was about to be killed and kill himself, living under the earth in mud with rats and the fate of an exploding grenade just a few feet or seconds away. It was not a heroic fight of the best, but brutal war machinery. So this Christmas, a peace movement spread like a fire of candles from Belgium to France with thousands of men participating. In some places it went even further to bring together the Krauts with the Tommys and Jacques. At the Yser canal, German soldiers stood up and just walked to the British troops shouting “Comrades, don’t shoot!” The Brits raised and walked to the Germans, they shook hands and smiled at each other. The 16th and 17th Regiments from Bavaria had organized a cease-fire near the destroyed city of Messines to bury their dead. The 20th Bavarian Regiment fraternized with the French of the 99th Infantry Regiment. The Saxonian Regiments (near Ploegsteet-Wald, Wulverge, Frelinghien) also made peace with their enemies. The 14th Warshire Regiment, stationed behind St. Yvon, documented the Christmas surprise in its “War Diary.” A German soldier shouted: “Come over here, Warwicks!” Then he marched to the English trench. A Warshire rifleman came out to meet him half way, both without weapons. Were they brave or mentally ill? Suddenly, many more men came out of the trenches to join them. The German soldiers gave the English some of their Christmas presents like hard wurst; the British handed out their Princess-Mary Boxes, Bully Beef and chocolate. This lasted from 8pm in the evening until noon the next day - a Christmas peace on the battlefield. The Commander of the 6th company of the 179th Royal Saxonian Regiment saw the Englishmen coming out of their trenches, waving and shouting “Merry Christmas!” He commanded: “No shooting!” and marched to the British officer. They wished themselves a Happy Christmas. Then they agreed on a local cease-fire for Christmas. Some soldiers even organized barbeques and soccer games together. After Christmas was over, the fights started again and led to the decline of Europe and the deaths of more and more young people.